Rada knows little about her Bulgarian heritage because her family doesn't practice their customs. That changes when her grandmother comes to visit. On a trip to the zoo, Rada discovers more than animals. She learns that diversity is not something to be ashamed of. Her grandmother tells her about the traditions of their ancestors and the meaning of the martenitsi that she makes every spring. 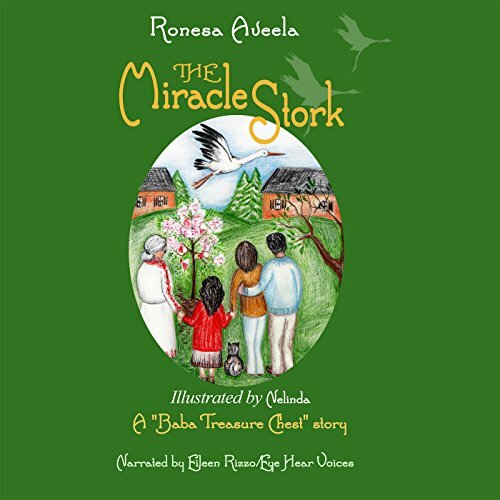 The Miracle Stork is a story about creating and maintaining traditions and customs to embrace who you are. In the tradition of family togetherness, Baba Treasure Chest stories are geared toward the entire family. What did you love best about The Miracle Stork? I loved it because it is a family story that anyone can listen to. What other book might you compare The Miracle Stork to and why? Which character – as performed by Eileen Rizzo and Eye Hear Voices – was your favorite? Rada was my favorite. Eileen knows how to deliver. No. I did not have an extreme reactions but I loved the voice. Grandma Nada has a special day with Rada, going to the zoo and teaching her about their heritage. The narrator kept me entertained with her different character voices.